Studio 17 has any fashion forward, sleek style that a girl could possibly dream of. These dresses are an excellent choice for the girl who loves bold and bright colors, stunning silhouettes, trendy and fun flare, and great prices. Whether you want a gown that is dazzling and glitzy or if you are searching for a simpler silhouette that is form flattering and elegant, our assortment is sure to have the perfect one for you. Dare to stand out and make an impression in a gown from this stunning selection. Trendy and modern, and designed with the modern fashionista in mind, Studio 17 dresses offer the hottest fashion trends in an array of different fits and styles. Stand out with style and poise in one of these unique designs. 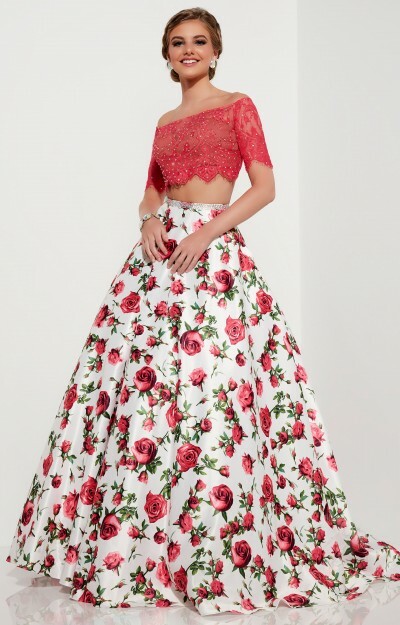 Girls of all different figures will find something they love with this assortment of Studio 17 prom dresses, whether they are searching through our pink ball gowns, or a navy blue prom dress with an open back, chiffon fabric, and straps for support. Explore different color options as many of these gowns are available in several spectacular colors. Find the gown that is perfect for you and that fits your shape comfortably. Stunning beadwork and dazzling sequins are popular among this line as well as sleek and chic silhouettes that are sure to turn heads. We love helping our customers find exactly what they are looking for and with Studio 17, the possibilities are virtually endless. With so many great styles available in a variety of wonderful colors and prints, there is something for everyone in this collection. We would be happy to special order one of the Studio 17 formal dresses from this assortment for you if possible and in many cases, this can be done in time for your event. Start the search for your perfect gown here and we know you won't be disappointed with what you find. This line is gaining popularity every year and more and more customers find themselves falling for these spectacular styles. Become one of them and add a new gown from this selection to your wardrobe. With the perfect combination of classic and metropolitan designs, you are sure to find the perfect dress with Studio 17. If you are interested in looking through similar lines with different lengths and stylings, look through our Tiffany Designs, Hannah S, and Panoply collections. Browse below and see what the hype is about or visit one of our store locations to try these styles for yourself!